Peel, core and cut apples into cubes. If apples are very sweet, add juice of 1/2 a lime or lemon. Place in a microwave oven proof pie dish, with 2 tablespoon of water. Cover and microwave on full, for 5-6 minutes. You can stew apples in a pan, if you do not have a microwave. Cooking apples is necessary because bread crumbs cook faster than crumble made of flour and this means that the apples do not have enough time to cook. Place bread slices and butter together in a food processor and make crumbs. Add cinnamon and sugar/sweetener to the stewed apples and stir in gently. 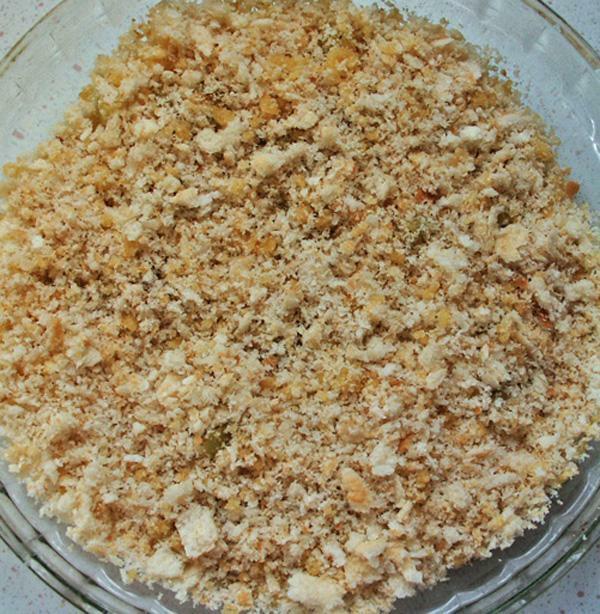 Cover with a layer of bread crumbs. Cook in hot oven, at 200C, 400F or Gas mark 6, for 20 minutes, until crumbs look golden. Serve hot, with custard or vanilla ice-cream or cream. Tip from Stokey Sue of BBC food message boards: Butter the bread before making crumbs with it. This kind of forces the butter into the bread and it crisps up much better than if you just dot the crumble with bits of butter, as it usually tells you in a crumble recipe".